The key architect of the soft coup in Zimbabwe this week traveled to China and met with top military officials just days before the confusing and still-unfolding government shakeup, sparking speculation that Beijing may have played a role in the coup that has seen Zimbabwean President Robert Mugabe placed under house arrest. General Constantino Chiwenga, who leads the Zimbabwe Defense Forces (ZDF), met with a top official with the People's Liberation Army (PLA), General Li Zuocheng, on his trip to the Asian giant. Zuocheng, chief of the Joint Staff Department of the Central Military Commission, told Chiwenga that "China and Zimbabwe are all-weather friends," according to a report from the Chinese Defense Ministry. Chiwenga reportedly replied that Harare wanted to "deepen exchanges and cooperation in all fields with China to promote the rapid development of bilateral state and military relations between the two countries" — standard official boilerplate after government meetings, to be sure. Chiwenga also met with General Chang Wanquan, Minister of Defense, and thanked him for Beijing's "long-time, selfless help" to the young state of Zimbabwe. Chiwenga then returned to Zimbabwe and issued a bold and unprecedented statement in response to the removal of his political ally, Vice President Emmerson Mnangagwa. On Monday, he declared that the military would "remind those behind the current treacherous shenanigans that, when it comes to matters of protecting our revolution, the military will not hesitate to step in." Mnangagwa, a former soldier who enjoys great popularity with the military, had served in the government of independent Zimbabwe for 37 years. 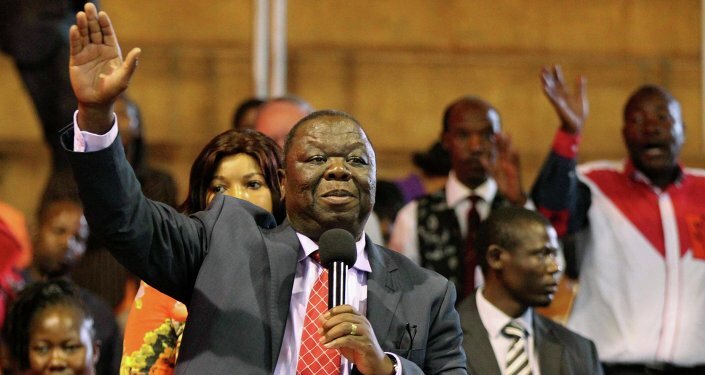 Many saw him as the likely successor to 93-year-old president Robert Mugabe — until Mnangagwa was suddenly ousted on November 6. This was taken as a signal that Mugabe wished his successor to be his wife, Grace Mugabe, who wields considerable power in the youth wing of ruling Zimbabwe African National Union-Patriotic Front (ZANU-PF) party. Chiwenga and other military leaders, angered by the prospect of independence-era ministers being ousted by Grace Mugabe and her supporters, leaped into action. They had the Mugabes placed under house arrest and arrested one of Grace's lieutenants, Finance Minister Ignatius Chombo. A report obtained by Zimbabwean newspaper The Financial Gazette claimed that Chiwenga would install Mnangagwa as the country's new president, to lead a "transitional government that would rule for five years." 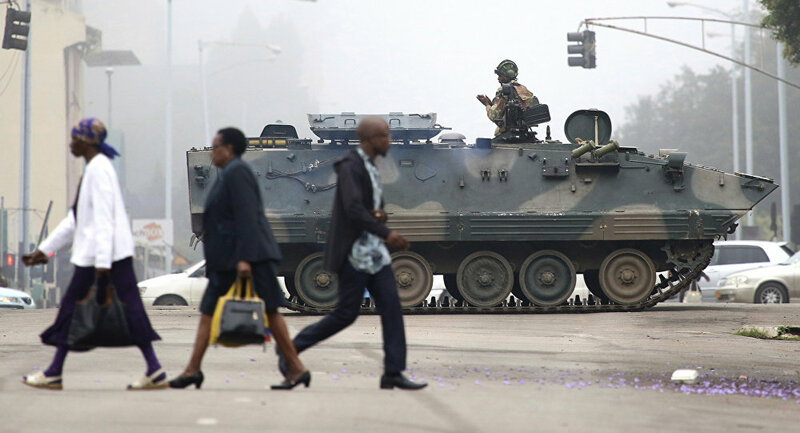 Unrest and Uncertainty in Zimbabwe: What Will the Country's Military Do Next? But how does Beijing figure into what is visibly an internal power struggle? They certainly have a vested interest in Zimbabwe, as they are the African country's largest foreign investor, funding billions of dollars worth of development projects, including a new parliament building in 2016. Washington, DC, think tank The Jamestown Foundation once described China as the "only major international supporter" of the isolated Mugabe regime. But although Zimbabwe and Mugabe are synonymous to many, Beijing has been surprisingly relaxed on the prospect of his overthrowal. An editorial in The Global Times, which is owned by the Chinese Communist Party and is often used to disseminate Beijing's official line on issues, said that the coup "will not affect the general trend of bilateral ties." "The long-term friendship between China and Zimbabwe will transcend the internal disturbances in Zimbabwe," the article said. Shen Xiaolei, an Africa expert from the state-run Chinese Academy of Social Sciences, told the South China Morning Post that Beijing would respect Zimbabwe's "own attitudes." He lamented the fall of Mugabe, but added that "the Chinese government has [a policy of] non-interference in Africa's internal affairs." The timing of Chiwenga's visit has sparked speculation that he visited China to warn Beijing of the impending coup, or even seek China's blessing. Shen denied any such cloak-and-dagger activity. "Chiwenga's visit was arranged long ago, so it's impossible he visited China over this matter," he said.